Please don’t kick me out of the Zero Running Back Strategy fan club for voicing some concerns about the theory. 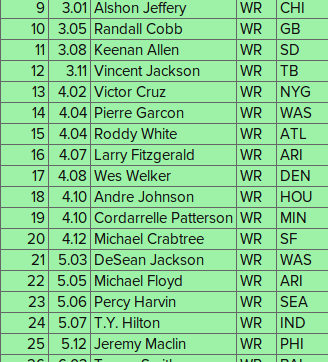 I plan on implementing this strategy or forms of it in all of my 2014 fantasy football drafts, but after reviewing some of my mock drafts, I realized the lack of depth at the receiver position after the second round. The concept behind zero running back is to help eliminate risk of drafting a running back who will end up as a bust, but what if the receivers you are drafting in the third and fourth rounds won’t return the value of their ADP? Outside of Alshon Jeffrey, round three is a little concerning for the depth of receivers. Even with Aaron Rodgers as his quarterback, Randall Cobb has only produced one fantasy relevant season(2012-954 receiving yards, 8 touchdown catches), and even those were not earth-shattering numbers. Jordy Nelson has been much more consistent over the past three seasons, and Jarret Boykin emerged as a an option in the passing attack last season. As a third-round slection, I don’t like the unpredictability around Cobb. In six of Kennan Allen‘s six performances of 12 or more fantasy points, he recorded one game with two receptions and only 29 receiving yards. He also had a performance with three receptions and 59 receiving yards. What saved his day, was the fact that he recorded two touchdown catches in each of those games. If Allen did not receive those four touchdown catches, he would have tied with Brian Hartline as the 26th-highest scoring receiver. If he recorded just two touchdown catches, he would have finished as the 23-highest scoring receiver. His targets fluctuated wildly throughout the season, and I do not feel comfortable awarding him a third-round pick. Finally, Vincent Jackson finishes off the third round as a risky selection. To me, Jackson is the wide receiver version of Frank Gore in fantasy football. Every year you hear that he is done, but since 2008, Jackson has recorded 1,000 or more receiving yards in five of the last six seasons. With a new quarterback, a new coach, several weapons in the rushing attack and the addition of future star Mike Evans, there are just too many variables surrounding Jackson for fantasy football players to feel comfortable about his situation. 1. The success of Cruz solely relies on the abilities of Eli Manning. If Manning finishes another year with fewer than 20 touchdown passes, Cruz’s season is sunk. 2. With the addition of De’Sean Jackson and RG3 learning a new system, can Garcon see another season with over 1,000 receiving yards? He only recorded five touchdown catches last season, so his value is his ability to accumulate receiving yards. 3. I actually like White in the fourth round, but 32-year old receivers aren’t really known for their production. Combine that with the fact that he struggled with various injuries throughout last season, and he could be one play away from sitting out the whole year. 4. This is probably going to be Fitzgerald’s last season with the Arizona Cardinals, and the organization is putting their hopes on Michael Floyd as the future. Fitzgerald only averaged 59.6 receiving yards per game last season. 5. Peyton Manning is very unlikely to repeat his monster season from 2013, which means there will be less scoring opportunities in 2014 for the Denver Broncos‘ receivers. At 34, Welker has competition among his younger teammates for Manning’s attention. 6. I believe he is still a great player, and I would love to seem him be traded to the New England Patriots, but Johnson is in a tough situation with the Houston Texans. With the potential emergence of DeAndre Hopkins and Ryan Fitzpatrick leading the offense, Johnson may not have an environment for a successful season. 7. Patterson is talented, but I am not sure that the Minnesota Vikings exactly know how to use him. I am not willing to spend a fourth-round pick to find out. 8. Quarterback Colin Kaepernick has a ton of new weapons, and I don’t know how Crabtree will play into that. The San Francisco 49ers also expanded the rushing attack with rookie Carlos Hyde, and I am weary of how often Crabtree will see the ball. I don’t think I need to go into the fifth round. I can’t just poke holes in the zero running back strategy, however, without offering any sort of remedy or advice. I do really believe in this strategy, but drafting three wide receivers straight may be more risky than some analysts may want you to believe. 1. Draft a quarterback and tight end in rounds three and four, and come back around in round five to select your third wide receiver. I really like Floyd, and I think he could end up as producing the value of a third-round pick, but again, I do not want to take that risk. I know what I am getting with Julius Thomas in the third round, and even if Rob Gronkowski is a little risky, I can back him up with a solid tight end later in the draft. There are purest out there who say you have to draft a wide receiver every single round before you draft any other position, but sometimes things just don’t work out like that. 2. This is blasphemy, but you could consider taking a VBD(value based drafting) approach. With value based drafting, you are selecting players who present themselves as value in the position they are available. If you have a pick in the middle of the second round and Jimmy Graham hasn’t yet been selected, that can be considered a value based draft pick, as his ADP is normally near the middle of the first round. So lets say your first round-pick is Calvin Johnson, and your next pick is Brandon Marshall. If DeMarco Murray has somehow fallen to the third round, you could consider drafting him. If you see receivers you like you can select in the fifth round like Floyd, Emmanuel Sanders and Torrey Smith, you could hold out until that spot to draft your third receiver. Again, this does go against the idea of finding more value and consistency with wide receivers, but if you don’t like the wide receivers available to you, you need other options. I am still a big fan of this concept, but that doesn’t mean it is without flaws. Whatever strategy you use, the most important part of fantasy football is liking the team that you draft.